Scott McCarron made a birdie putt on the first extra hole and beat Tom Byrum to win the second of three PGA Tour Champions playoff events. 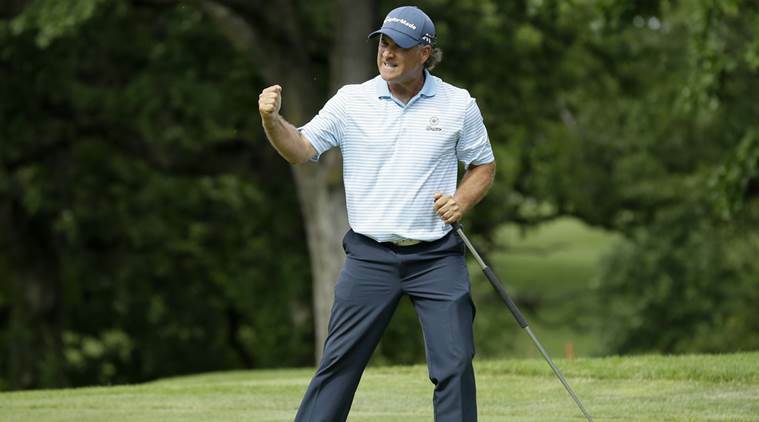 Scott McCarron made a birdie putt on the first extra hole Sunday and beat Tom Byrum to win the second of three PGA Tour Champions playoff events. McCarron and Byrum both shot 3-under 69s in regulation to finish at 13-under on the James River Course at The Country Club of Virginia. Byrum created the tie with a birdie at the 16th hole. Both made pars on the next two holes before McCarron’s winning putt on the extra hole gave him his second victory this season. Byrum, seeking his first victory in a PGA event since he won the Kemper Open in 1989, putted first on the first extra hole, but his 15-foot putt slid past on the left edge before McCarron rolled a slightly bending putt into the center of the cup. Kevin Sutherland, who shot a course-record 63 with seven birdies and an eagle, and Brandt Jobe (67) shared third place, with Fred Funk alone in fifth after finishing his round with four consecutive birdies for a 67. Sutherland also challenged for a coveted top five spot in next week’s Charles Schwab Cup Championship in Scottsdale, Arizona. But Sutherland needed McCarron to falter and when the 51-year-old did not, Sutherland wound up sixth in the standings. The top five players two-time defending champ Bernhard Langer, McCarron, Colin Montgomerie, Joe Durant and Miguel Angel Jimenez will automatically win the championship by winning next weekend’s final event in Arizona. Langer, who played despite a sore knee that kept him out of last week’s tournament, shot a 71 Sunday and finished tied for sixth at 9-under. Each dollar earned Sunday is worth two points first place is worth $305,000 and 610,000 points this week _ and is added to the regular-season total. At the Charles Schwab Championship, points will be reset so that the top five only have to win to capture the Charles Schwab Cup.